Thank you for your interest in seeing our production of Lion King Jr. The performances will take place at the Carroll Arts Center, located at 91 W. Main Street, Westminster on Saturday and Sunday, June 8 & 9, 2019. Seniors show times are 1 & 5 pm each day and the Junior Showcase will be at 3:45. Once your order is placed, we will email you within 24 hours to make arrangements for pick up or Will Call. All ticket prices listed below are inclusive of Maryland State entertainment tax and service fees. Adult tickets are for ages 18 years and older, child tickets are ages 4-17. Under 3 is free but must sit on an adult lap. Actor you are coming to see? By clicking “Add to Cart” you are agreeing that there will be no refunds should you change your mind about registering for our program. Unfortunately, Spotlight Musical Theatre does not offer refunds. We would be happy to give you a credit towards a future production or summer camp program if you cancel, with written notice, a minimum of 2 weeks prior to the first day of program enrolled. Mt Airy welcomes Spotlight Musical Theatre for children and teens. Register today for our next production! When are the shows for Into the Woods Jr? 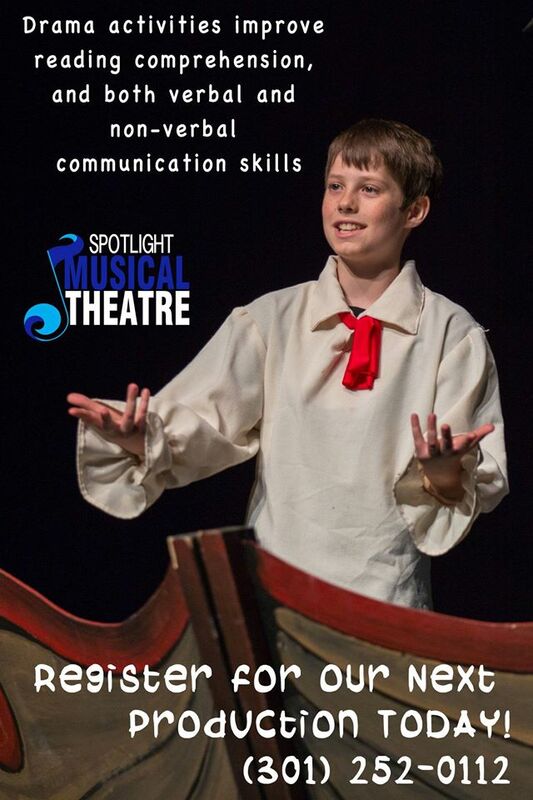 Spotlight is the perfect choice for children's theatre and musical theatre lessons. We service areas all over Maryland including Damascus, Green Valley, Eldersburg, Frederick, Montgomery Village, Germantown, Redland, Olney, Westminster, Gaithersburg, Reisterstown, Randallstown, Columbia, Rockville, or Owings Mills. Join us for our upcoming productions in Mt Airy where we integrate musical theatre, acting, singing, dance, sound, lights, costumes, props, stage management, and performing into a well rounded Musical Theatre Program. Click here to register for our next production! Spotlight Musical Theatre was created to grow artists to their fullest potentials; providing them a well-rounded musical theater education, educating them on the industry, and supplying the necessary exposure to foster their talents. Unfortunately, Spotlight Musical Theatre does not offer refunds. We would be happy to give you a credit towards a future production or summer camp program if you cancel, with written notice, a minimum of 2 weeks prior to the first day of program enrolled. For general inquiries,please email us at spotlightmusicalsmd@gmail.com.